We recently completed a new logo for Yoga Activist, an awesome project started by the folks over at Yoga District! Dig it. 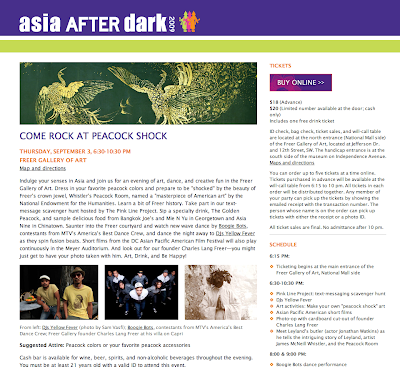 DJs Yellow Fever at the Smithsonian Freer/Sackler Galleries! All yellow, All night! Under a perfect summer night last night, DJs Yellow Fever (Brian and Nick) spun a rare all-asian set in the beautiful courtyard of The Freer Gallery Of Art for their sold out "Asia After Dark" event. We spun everything from cambodian and vietnamese psych, 70's thai pop, bollywood, to asian hip-hop, with special guest musicians Jerry Busher (Small Doses, Federico Aubele, French Toast, Dust Galaxy, Fugazi) on drums and Hash Vyas (Thievery Corporation, Federico Aubele, Dust Galaxy, Gogogo Airheart) on bass. Extra thanks to the gallery staff, their support, Amanda Williams, The Pink Line, and Jerry & Hash for playing this amazing gig with us. Also thanks to Sam Vasfi for taking our photos. We'd appreciate any additional photos and/or links anyone would send our way. Thanks so much! Sam Vasfi's "serious/legit" photo of us. pretty funny, huh?